Russia has great traditions in winter sports and it may just be a natural choice for Indians to support Russian athletes in the up-coming Olympics. It was a cold late-winter night in Yuzhno-Sakhalinsk in March of 2003. I was excited about a sporting event that captivated all of India, but in a distant corner of the Russian Far East, a few expats from England and its former colonies were the only people who knew that India was playing in the final of the Cricket World Cup in South Africa. I’d been in Russia for less than a month at that time and stayed up to date on the Indian cricket team’s progress to the final. There were a series of memorable wins, including convincing victories over England and Pakistan. This was our year, or so I thought before Zaheer Khan had a bad day, a really bad day. A Russian friend with satellite television arranged for a long party, where we’d watch the match and cheer on India. It was obvious after the Australian innings that India did not have even a remote chance of winning. An amused group of Russian friends watched the match with me until I threw in the towel. They enthusiastically cheered on India and tried to console me as my team was trounced by a stronger Australian side. Being 10 time zones ahead of South Africa, where the match was played, we were all in a dazed state and our sorrows were drowned out by the choicest of beverages well into the morning. “It’s okay, we reached the final anyway,” a friend of mine said. He meant the “we.” Russia was not a cricket playing nation and by default my new cricket-loving friends would support India. Amazingly enough three of the friends who were with me on that night in Sakhalin, happened to be in Delhi in April 2011, when India did win the World Cup and joined complete strangers near India Gate and celebrated the win throughout the night. A week after the 2003 World Cup final, I was invited to go ice-climbing by Sakhalin’s Tihaya Bay. As someone who had long suffered from a fear of heights, this seemed like a joke, but my friends who watched the match with me insisted that I return the favour and camp by the frozen sea in biting cold and then attempt to scale an ice-covered hill. As soon as we arrived by the bay, I knew that this would not be an easy weekend. Sure, we were dressed for the occasion but even the task of walking on the frozen layer of the sea for a few kilometres with heavy backpacks took every bit of physical and mental strength that I had. Of course when it was my turn to climb up, I managed without much of a problem but climbing down was a problem and I made a mess of the whole situation. This particular area where we set up camp had many sporting enthusiasts and embarrassed as I was, I was expecting to be laughed at. The reaction was quite the opposite. Complete strangers gave me a standing ovation and people walked up to me and praised my courage for coming out there and even attempting the climb. 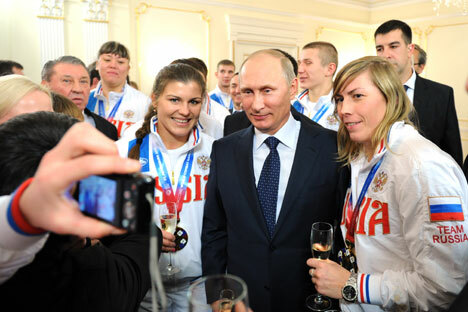 That’s when I saw the Russian sporting spirit for the first time. Over the next few years, whenever I fell while skiing and skating and trying various forms of winter sports, there was always a hand to help me up and encourage me. Eleven years after that camping trip by the Tihaya Bay, I no longer have a fear of heights and more importantly, the city slicker in me, who was raised in New York and Mumbai, has given way to someone who swears by the Great Outdoors. It was Russia that turned a quintessential urban dweller into both a sportsman and nature-lover. When the Olympics get under way in a few weeks, I will naturally be rooting for Shiva Keshavan, Himanshu Thakur, Hira Lal and Nadeem Iqbal, who will be playing under the Olympic flag since the Indian Olympic Association has been kicked out by the international governing body. But in the categories that don’t involve these athletes, I will be happily waving another tricolour. Right since 2006, I have been seeing advertisements on Russian television about the Sochi Games, encouraging children to take up winter sports. These games will be a culmination of years of dedicated efforts by young Russian athletes to represent the country in such a grand stage. Such is the dedication that young skiers even practise in the summer using skates. This is the most prepared Russia has been for the Winter Olympics since the days of the Soviet Union and the Olympic fortnight promises to be an exciting period. I will try and be as enthusiastic about the Russian winter athletes as my Russian cricket-loving friends are in supporting the Men in Blue. Of course, much to their chagrin, I am not making any commitments when it comes to the FIFA World Cup coming up later in the year in Brazil.